For the first-time grower, it can be a truly daunting task to select the best nutrients for their cannabis, and they’ll often spend far more money than they need to. With so many options to choose from that range from hydroponic to organic nutrients, new growers can quickly get overwhelmed. 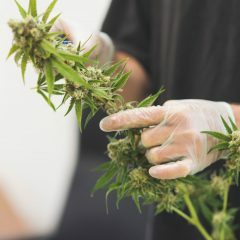 But with a little bit of knowledge about the requirements of cannabis plants and how they absorb and utilize nutrients, you can confidently select the products you need without breaking the bank. Which Elements Does a Cannabis Plant Need? Your cannabis plant needs a main group of elements that are collectively referred to as macronutrients. Here’s a breakdown of the mineral and non-mineral elements you need to feed your plant. Nitrogen is mainly responsible for a plant’s development during the vegetative stage of its life. It’s an essential part of chlorophyll and without it, a plant can’t turn sunlight into energy and it won’t be able to grow. Nitrogen is also part of the amino acids that act as building blocks for proteins in a plant. Without the necessary proteins, your cannabis plants will be weak and frail. Nitrogen is also a part of ATP, which allows plant cells to control the use of energy. Nitrogen is also necessary to create nucleic acid, an essential ingredient in DNA or RNA, and without it, cells won’t be able to grow and multiply. Phosphorus is important for producing large, healthy buds. The key role of this element is to help make nutrients available for the plant to uptake. These nutrients than are used to build the structure of the plant as it grows from the roots to the flowers. Without adequate phosphorus, plants will show signs of undeveloped roots and might not even flower. Early signs of phosphorus deficiency shows up as a purple hue in the veins of leaves. Potassium has a number of jobs that largely help to regulate the systems that keep a plant healthy and growing. It plays a large role in osmoregulation, the passive regulation of water and salt concentrations in the plant. Potassium accomplishes this by controlling the opening and closing of the stomata which is how a plant exchanges CO2, H2O, and oxygen. Potassium also triggers the production of ATP, which works to store energy produced in photosynthesis by creating glucose. This glucose is then used as energy for the plant as it grows. Without sufficient potassium, you will see weak plants starved for energy that appear burnt because they are unable to successfully regulate the exchange of CO2, H2O, and oxygen. Calcium is responsible for keeping the structure of cell walls in a plant together. Without calcium, new growth won’t develop properly and the plant won’t function as it should. New growth will be stunted, leaves will curl, and rusty spots will show up on the plant. Magnesium acts as the central molecule in chlorophyll and without it, plants aren’t able to generate the glucose from photosynthesis. No magnesium means no energy can be converted from sunlight. Once magnesium has helped create glucose, it helps metabolize glucose to make it available for the plant to grow. Without sufficient magnesium, you will find yellowing leaves, with discoloration reaching the veins as well. Next, we’ll examine the main types of nutrients used by cannabis growers today as well as their proper application. Before you start growing, however, we highly recommend learning about the basic mechanisms through which plants absorb water and nutrients, osmosis and active transport. Hydroponic growing is simply the practice of growing plants without soil, usually with some other sort of substrate like rockwool, clay pebbles, coco coir, or some sort of mix. Many of the premium “potting soils” marketed for growing cannabis are actually soilless blends. Most indoor cannabis growers are growing hydroponically, even if they’re using buckets of “potting soil” and hand watering each plant. For this reason, the vast majority of the nutrients sold specifically for cannabis cultivation are hydroponic nutrients. These products are comprised of concentrated mineral salts, usually in liquid form but sometimes as powders, that are to be diluted in water to a level that is suitable for the plant. Nutrients must be water soluble in order for the plant to absorb them. Liquid products are sold in two parts (usually labeled “part A” and “part B”) because they contain elements that will precipitate out of the solution if mixed together at a high concentration, making them unavailable. Combined in the correct volume of water, this is not an issue. Products are also divided between “Grow” solutions, high in nitrogen needed for vegetative growth, and “Bloom,” high in phosphorus for flower development, because the cannabis plant has different nutritional needs during different stages of growth. Great care should be taken when applying hydroponic nutrients, as overfeeding can lead to plant damage and even death. A general rule of thumb is to start at about 25% of the level recommended on the product label and gradually work up to full strength. Hydroponic nutrients are often used by soil growers with good results, but this technique is not recommended for the beginner. What sets soil apart from hydroponic media is the presence of non-inert organic matter like humus, compost, manure, and worm castings that contain many macro and micronutrients. Much of the nutritional value in these substances is locked up in non-soluble form, however, and must be processed by soil-dwelling microbes and fungi in order to be of use to the plant. Non-organic nutrients designed for soil growing are less common at the grow shop because they can quickly build up in the soil, harming the soil life as well as preventing the uptake of water and nutrients by the root system. 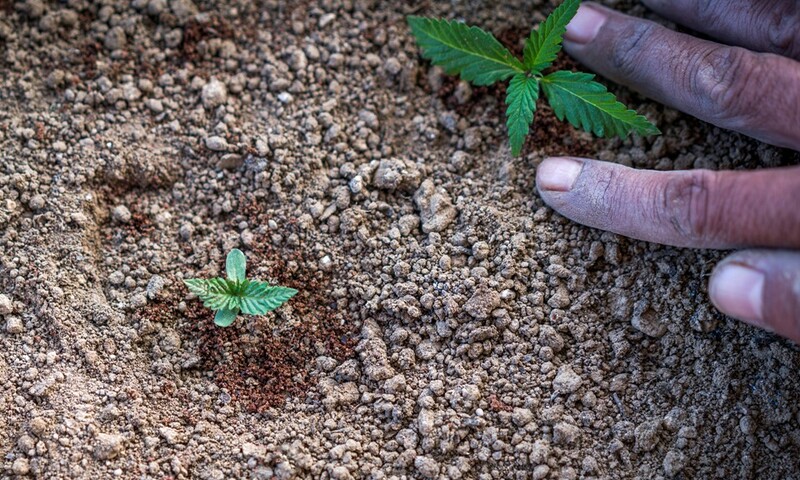 Organic fertilizers and nutrients for cannabis are far more forgiving; they usually contain less immediately soluble nutrients and more elements that are beneficial to soil organisms. The first-time grower who decides to use soil as their medium would be well advised to stick to organic fertilizers and nutrients. The least expensive way to do this is to use things like blood meal and fish meal for nitrogen, bone meal and bat guano for phosphorus, wood ash and kelp meal for potassium, dolomite lime for calcium and magnesium, and epsom salts as a source of magnesium and sulfur. Most of these items can be purchased cheaply at your local home and garden center and then mixed in small amounts into the soil before potting. Done correctly, you’ll only need to water your plants and occasionally add carbohydrates to feed the soil life. There are also commercially available soil blends that already contain the proper mix of these types of ingredients. Alternately, there are pre-mixed organic nutrient solutions you can buy that take the guesswork out of feeding your plants. These tend to be expensive, but the benefit is that you can simply follow the manufacturer’s feeding schedule and get good results. The key to successful organic growing is cultivating a diverse and healthy population of soil microbes and mycorrhizae in the soil. Many premium soil blends come pre-inoculated with these organisms, and there are many (often expensive) additive products available that add additional life to your medium. However, the best (and cheapest) method of inoculating your soil is through actively aerated compost tea (AACT), something you can make yourself with just a few inexpensive items. By using this technique, you may find that you don’t need to add very much in the way of nutrients or fertilizers; the soil life will process the organic matter in the soil into nutrition the plant can readily absorb. There are many ways to grow cannabis, and each has its benefits and drawbacks. Organic soil is more forgiving of mistakes and less than ideal conditions, but often produce smaller yields and slower growth. Hydroponics and synthetic nutrients can offer bigger yields and quicker flowering times, but require a great deal of attention and knowledge to be successful. The best advice for the beginning grower when selecting nutrients and fertilizers is to make sure you’re using products that are compatible with your technique and medium, as well as with each other. Doing a little research before your first grow can prevent wasted money spent on unnecessary products. Happy growing! I see most fo the Roots Organics include Molases, while the rest of the contents the bat and bird guano seem to be awesome I have to ask where does the Molasses come in, we know plants do not absorb sugars from the ground and it actually impedes root growth and seed start http://www.biology-online.org/biology-forum/about10736.html so why would you do that to your crops. I myself go the other route with a clean and known quantity of substances so I get same results everytime. I use Cogo’s Original Cannabis Fertilizer Formula from CogosOriginalCannabisFormula.com and some of the results have been simply incredible. It’s so clean I even seen an aquarium use movie of it… for aquaculture with a bunch of fish swimming around and beautiful plants. People say that sugars really enhance tge amoubt of trichomes. Sugars feed the microbe herd.. Yes that’s absolutely true. Its actually the carbohydrates that feed the soil. I keep reading about molasses, but I am skeptical that it may just be rumor repeated until it seems factual. Does anyone have a scholarly article that would support this? Molasses is used for it’s natural sulphur not it’s sugar. I started using Tasty Garden single tank professional fertilizers. It is the best fertilizer I have ever used. It works great in soil, coco coir and hydroponic systems. They offer a fertilizer for vegetative – Plant & Grow, one for flowering – Fruit & Flower and a bud booster – Size & Flavour. I have used many ferts over the years and Tasty Garden is the one to use if you want big, strong healthy plants with awesome yields. Can you purchase this in the U.S. and what website did you use? I had a friend purchase it for me in Europe and UPS it over to me. I bought 1 kilogram of the vegetative, 2 kilograms of the flowering and 250 grams of the bud booster. You usually use more of the flowering fertilizer than the vegetative fertilizer and you only need the bud booster for the last several weeks of growing. Best fertilizer I have used- dissolves quickly and is pH neutral. Good article about growing cannabis. I didn’t really think about the fact that growing in a soilless medium was a good opportunity to use hydroponic nutrients. It’s more forgiving than straight nutrient solution alone since the organic matter can buffer some of the nutrients allowing for easier plant uptake. The only organic fertilizer that I am aware of that includes ALL 72 trace minerals in a plant available form is MightyGrow Organics Living Organic Fertilizer 4-3-4. It is available online from mightgrowfertilizer dot com (not the company’s website) or from a local garden center. If they don’t carry the product, ask them to get in touch with the company at mightygrow dot com. As far as liquid organic fertilizer, two formulas will be available in the spring. A 3-1-2 “grow” formula and a 1-3-2 “bloom” formula. Additionally, a minor mineral, trace mineral, humate liquid is in development. A long time west coast grower has been interviewed about his experiences with using MG’s products. Check on the company website to watch. It should be uploaded by Jan. 1, 2017. In hydroponics and coco i use Remo Nutrients , very good quality and very decently priced !!! I want to set up a worm farm and use worm castings. I was a total noob and got the Three A Light book and they just got an app too! So I can message them or call them directly for help. Hi, I’m using foxfarm ocean forest potting soil and I was wondering can I use Flower Fuel and Cal-Mag Plus to my foxfarm trio ( Big Bloom, Grow Big and Tiger Bloom) to help my plant to flower. I would warn people that there a lot of pot businesses out there that are trying to sell their products, to make some quick bucks. Selling products has not changed much. People literally buy things that claim their product is the “new” quick fix that solves all your problems fast, and with little effort. Look at the so-called fitness industry. People have made millions selling “Voodoo” products that are not regulated, and claim outrageous results that you pay big bucks for when there are natural products that do the same thing for cheap. Learning a little bit about soil science can go a long way to creating a better soil with cheaper organic methods. A good compost, and potting soil, along with Alaskan Humus, worm castings, kelp, and a good organic fertilizer like Milorganite is all you need for a healthy organic mix that will satisfy just about any plant’s needs. Learn to make compost tea and you have it pretty much all covered. Chemical products are expensive and are unfriendly to the environment. Unless you are a commercial grower stay away from chemical and go organic. That is the best advice I have seen, ever!!!! Milorganite is NOT a certified organic fertilizer. It is processed human SEWAGE! There are plenty of real organic fertilizers, several of which are mentioned on this site. I manufacture MightyGrow Organic products, which are USDA/OMRI listed as allowable in organic food production. You should use nothing less than REAL organic fertilizer to grow cannabis. And MightyGrow is the only product that contains all 72 minerals needed to grow cannabis to its genetic potential. Personally a big fan of the Happy Frog fertilizers from Fox Farm, and good ol’ Maxicrop… Maxicrop, or Norwegian sea kelp is a great trace minerals fertilizer/supplement with a little bit of potassium as well. I have seen times personally where a cannabis plant is not growing with the optimum health and vigor, then simply maxicrop (sea kelp) was supplemented to the weed plant and in a matter of hours that plant’s color had changed to a deeper green and had visually gained vigor, eventually flowering and finishing up into some heavy yielding, big-budded chronic. Sometimes the small things may be overlooked in certain soils, adding sea kelp into your soil or onto your plant(foliar feeding) is a reliable way to ensure that hungry cannabis plants get the nutrients they need to grow big and yield hard. It actually means growing in water . Soil , leca or hydroton pellets , sand , Even glass … are considered mediums . Mediums are what the roots hold onto in order to support it’s own stalk , leaves or foliation and or buds and flower. In fact if given the space to due so the root mass will replicate the size of the plant length and width of the plant itself. Hydroponic systems do use mediums in not of the systems out there except maybe areoponic or if a areo-cloner or propagation machine is used to root cuttings . With soilless mix , and top feeding isn’t hydroponics , but place the pots or bags with soilless in a flood and drain or ebb and flow system and, voila! Growing hydroponically . In the very beginning , organic and hydroponic where two things not crossed together. Hydroponics increases the amount your able to directly feed your plants . With that dyntethic nutrients were made to help the plants increase the speed in which they grow as well . I won’t get into the whole organic / synthetic part of the hydroponic… but will say by using synthetic nutrients you helped feeding the plant as the plant does not have to search for the food as it is constantly flowing by or brought to the roots via flood and drain , nft, areoponic etc … that being said the plant now also didn’t have to work hard to process the organic foods to it’s synthetic form to use it as it was already done . Ie synthetic foods . Techna flora bc grow boost bloom gave monster yields. Ionic is a simple one part nutrients system. Advanced and canna are expensive but some of the best. General Hydroponics and botanicare is now owned by Scotts Mircle Grow and they run tooo salty. Technaflora, Roots Organics, FoxFarm , all great lines!!!! I am using Bountea compost tea, I feed this to my roots. M-3 for veg, B-3 for flowering I feed this through the foliage, I make my own medium primarily CoCo, Humus (Alaskan) bio-charcoal, peralite, sand and a small amount of soil. I throw a worm or two in my 5 gal clothe bags. this is a learning thing.have fun . figuring out what is wrong with a plant is all part of it. in a year or two we can look back and see what a dummy we were. this learning never stops. its challenging. rewarding.FUN. Bloom Yellow Bottle , Humboldt Nutrients, Technaflora, Roots Organics, Humboldts Secret are all great lines with good results. Dominion Organics, you will NOT regret trying these!